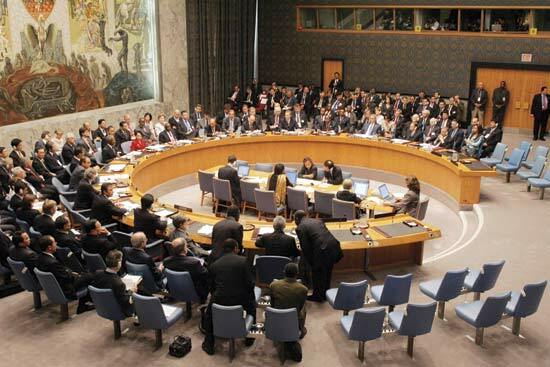 The UN Security Council has decided to take action against Qaddafi. France has shown particular initiative. The United Nations passed a vote on Thursday to begin enforcing a no-fly zone over Libya, as well as deciding to permit “all necessary actions” (code for military enforcement) to defend the civilian population of Libya from Moammar Qaddafi. This is incredible news, and though it comes quite late in the day, the Libyan opposition movement has been jubilant about the UN’s much more official and pragmatic declaration of support. In fact, it would seem that French jets have already fired on at least one occasion against Qaddafi, and the US has launched missiles targeting his anti-air defenses. The current number of missiles launched at this post’s time of publication was 110. Col. Qaddafi has been pushing the rebels back, city by city, towards the east, and has forced them as far as Benghazi, the current seat of rebel power. The declaration against Qaddafi was widely welcomed, and indeed celebrated by rebels, who see it as a somewhat late move but what could be a turning point for them against the dictator who runs the country. In response to the UN’s decision, Qaddafi “declared a ceasefire.” I put this in quotes for two reasons. First, this ceasefire seems to have yet to materialize. Witnesses have been reporting violence in Benghazi and elsewhere even after the so-called peace. Second, how is it at all possible to trust Qaddafi at this point? He’s made such ridiculous claims as “I have all the Libyan people with me and I’m prepared to die. And they are prepared to die for me. Men, women and even children,” in a letter to President Obama. Qaddafi is hardly known for his powers of common sense and rationality, and it shows plainly in his assertions that all of Libya stands beside him. Would a man so willing to lie outright about the loyalty of his people be honest about a ceasefire? No, it seems obvious that Qaddafi’s words have utterly lost their meaning. A man can’t go from spluttering violent threats against his own civilians to saying that there is peace. That said, I think Qaddafi still has a chance to step down or step aside. Now that the UN’s condemnation of his actions has taken a form stronger than words, Col. Qaddafi has a much shorter timer on his autocratic slaughter of his own people. With coalition forces beginning to hit his military, this dictator may begin to put his money where his mouth is (hopefully). This seems to be an answer to prayer for the rebellion, who have been almost pleading for foreign intervention to stop the bloodshed. Their desires have largely fallen on deaf ears, particularly in America, so this development comes as a very welcome change for the opposition. And while there are still drawbacks to military involvement in yet another Arab conflict, it’s a good thing overall that serious steps are being taken to put an end to Qaddafi’s massacre of his own people. It’s time that the international community, especially the US, puts some real meaning behind the assertion that democracy is a basic right for all people. 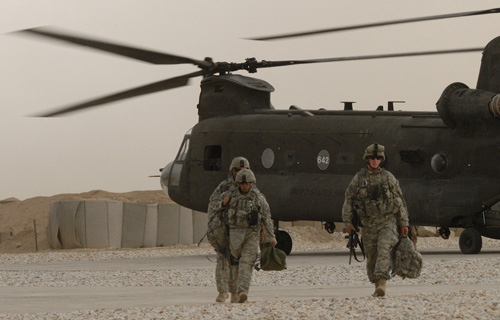 American soldiers exit a transport chopper in Ghazni, Afghanistan. Most if not all of my information for this post was taken from this article in the New York Times – just to let you know! I’d encourage you to read it as it provides a lot more detail than I do! As the war in Afghanistan grinds on, many soldiers (not to mention critics) are beginning to seriously question how much is really being accomplished there. In many ways, the war strategy has moved from one focused on the “key” areas of contention in the country: large cities, major thoroughfares, and borders with neighboring nations. But more and more, the fight is being taken to minute, previously unknown (to foreigners at least) villages and towns, with American and Afghan forces trying to clear the Taliban out of the country one building at a time. As you may have guessed, this isn’t going all that well. This war has been a difficult one since it began way back in October of 2001, and I think it’s safe to say that it hasn’t gotten much easier. The real problem behind this war’s difficulty has been the Taliban’s elusiveness and at-best shadowy presence in the country. Since being forced from formal power by Operation Enduring Freedom (the post-9/11 military retaliation), the Taliban has snaked into the shadows of the country, using fear to maintain small cells of power-by-terror that dot Afghanistan. Fighting the Taliban in Afghanistan is similar to trying to wave away clouds of smoke; as soon as they’re cleared out of one village, chances are they’ll pop up in another. To add salt to the soldiers’ wounds of seemingly pointless skirmish after seemingly pointless skirmish, many civilians in these tiny townships are far from cooperative. Some will simply play dumb or mute, some may lie, and some even signal troop movements to Taliban fighters nearby. But can these people really be blamed for this? The Taliban has a near stranglehold on many of the common people across much of Afghanistan, especially in areas out of the reach of government and police forces. They’re held under the extremists’ power by threats and violence, so it only makes sense that their loyalties are more likely to lie with the people who will kill them or their families if they defect. All the same, this makes the job of American soldiers immensely difficult. Tracking this secondary, shadow government of religious extremism is nearly impossible to do effectively when the people in the villages they’re attempting to clear are afraid to cooperate. The idea behind this small-village strategy has been to expand American presence in Afghanistan, essentially giving Taliban fighters fewer safe zones and places to seek refuge or terrorize civilians. The problem is, as the NYT article put it, is “translating presence into lasting success.” I used the analogy of smoke before: You may be able to clear the smoke of the Taliban away temporarily, but it somehow always manages to flow back in after you go. This war, which has already been trudging forward for more than 9 years, still seems like a dead end (and an expensive one at that). I know that the Taliban’s influence is a difficult one to root out, and that the group poses a very significant threat, both to people in the region and around the world. But how much longer can we keep trying? How much progress has really been made? The government in Afghanistan, nominally headed by Hamid Karzai, is corrupt at best, and many Afghan security forces (such as police or military) are either afraid or equally corrupt! This really makes one question how much the US has accomplished in Afghanistan. We’ve captured a few important Taliban figures, sure, but there has been little factual evidence that our efforts there are having much success. Does this mean I know what to do? No. I won’t claim to be a five-star general! I do, however, think that the US must refocus and redouble our efforts towards the reformation of the Afghan government and local forces. There can only be stability in this country if the people who live and belong in it know how to take their security and liberty into their own hands. How Should the US Handle Libya? A bomb crashes into the once-rebel-held town of Ras Lanuf. 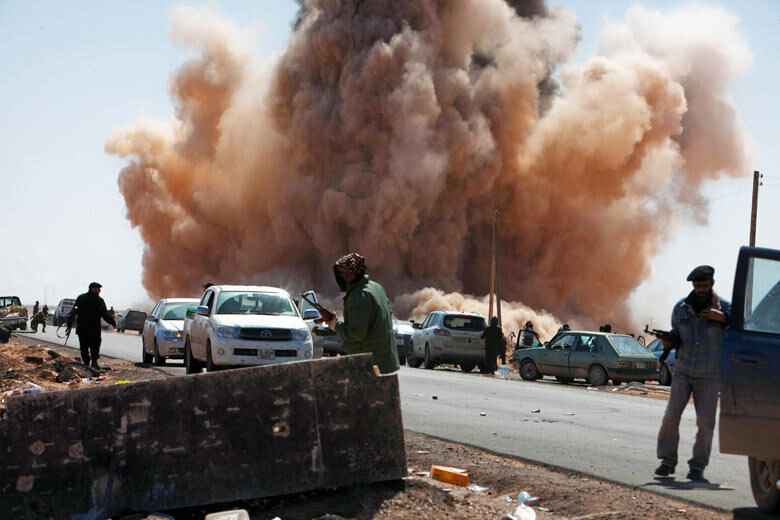 As the situation grows more and more chaotic in Libya, pressure is growing on other nations, particularly those who are NATO members, to put their money where their mouths are regarding Libya’s rebel movement. The calls for international assistance and support for the rebellion have, for the most part, fallen on deaf ears or been met with confused world leaders’ vacillating words of encouragement. The United States has been desperately scrambling to formulate some official stance to take. But there’s a lot of uncertainty and disagreement over the right course of action. President Obama has decided to exercise restraint as a general principle in the Middle East, as the situation over there has been an extremely sticky one politically. But is this the right course of action (or inaction) regarding Libya? Obama’s been forced into a corner on this one, as so many presidents have been. When a humanitarian crisis emerges in a country whose interests aren’t very closely associated with those of America, as happened in Rwanda in 1994, it’s difficult to find the right way to go forward. Things become even more difficult when one takes into account the fact that more and more people are dying every day deliberation goes on. Because of this, the president has unfortunately found himself trapped in an uncomfortable in-between, where he’s likely to face criticism and backlash no matter which decision he makes (but isn’t that just politics?). So what decision should he make? Should the US intervene in a country whose national security is only tangentially related to our own, at best? While Libya is a significant supplier of oil to European countries (most notably Italy), it seems that America would be relatively unshaken, whichever way events turn out, so there’s not a lot of economic or security concerns on the line. Besides that, the US has seen all too clearly how difficult and unpleasant over-involvement in other countries can be, time and time again, and of course most prominently in Iraq and Afghanistan. In fact, the rebel leadership has said that they don’t want the US to become involved on the ground, but simply to have a no-fly zone enforced. There are a lot of good reasons to remain distant from this conflict. But is it really right? I mentioned Rwanda earlier, and America did not intervene in the events there. 800,000 people died in that genocide, and while losses in Libya are unlikely to be quite so staggering, do we want to be a nation that stood back wringing its hands while a dictator steam-rolled his own people? This isn’t an issue of national pride, mind you. It’s an issue of human rights, and the defense of people who may not be able to do enough for themselves. Col. Qaddafi has proven himself to be utterly ruthless in ending this rebellion, and has had a number of significant victories over the rebels, pushing them back along the east coast. Chances are, with Qaddafi’s superior firepower and funding, the revolution won’t be able to stand up much longer. If our country and our leadership really support the democratic rights of others, shouldn’t we show that to Qaddafi in more ways than just telling him to leave? I don’t know if full military intervention would be the right pursuit in Libya. But I believe that it’s imperative to show the rebel movement that we’re behind them with more than words. Fukushima I, the power plant currently in danger of melting down. Even after all the horrifying destruction Japan has faced over the last few days in the aftermath of a record-setting earthquake and tsunami, the country may have yet another catastrophe on their hands. 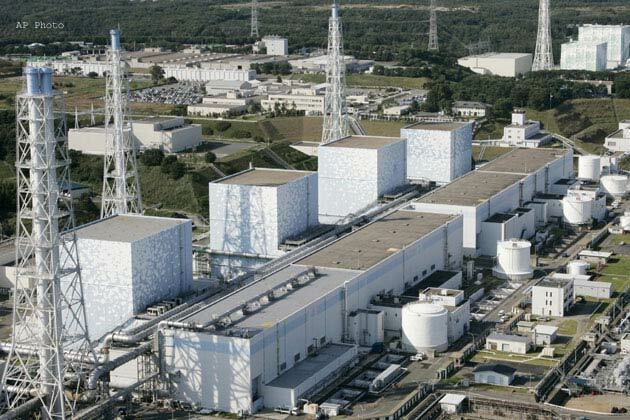 A nuclear power plant (NPP) called Fukushima I has been having some major difficulties remaining stable, after the combination of earthquake and tsunami left it badly damaged, and a number of other NPPs have been damaged as well. The government and power company operating the NPP are now saying that there’s a possibility that two reactors are currently melting down, an event which could release great amounts of radiation into the air and water. It’s still not quite clear at this point (to the best of my knowledge) what the extent of such an accident would be. Experts are saying that the current situation in Japan is already among the top three worst nuclear accidents in the history of nuclear power, along with the events at the Three Mile Island plant in 1979 and the awful disaster that was Chernobyl. But there’s still the possibility of this crisis-waiting-to-happen taking first place for nuclear catastrophes. Part of the problem here is that the Japanese government has been waffling on the exact state of affairs. The reports given by government officials have vacillated between “it’s only a minor leak to relieve pressure” and “nuclear meltdown is underway.” So it’s been hard to say and see exactly what might be happening, and how severe consequences might be. However, an international security expert said on a fascinating CNN video that the situation is more likely to turn out alright, rather than as a catastrophe (though he doesn’t rule out the chance that a nuclear catastrophe might occur). The expert posits that the authorities’ tactic for solving the problem is one that would render the NPPs completely and permanently inert. The plan at this point is to flush the reactors with seawater and boric acid. According to the expert in the video, these methods should not only stop the reactors from working temporarily, but completely destroy their ability to produce nuclear energy. A willingness to do something so drastic is a good indicator of the seriousness of this situation. If the government and the power company who runs the plants are willing to suffer the permanent loss of these NPPs, then they must see the possibility of a huge meltdown. It is encouraging though, that the government and the electric company running the plants are willing to take a loss to shut these down. As I said in a previous post, this situation is still far from resolved. Death tolls are rising dramatically as rescue workers search for the wounded or dead, and the country is tense under the threat of a possible nuclear crisis. All anyone can really do now is offer ny assistance and support they can. One of the more popular protest signs in an area rife with division and legal controversy. The political situation in Wisconsin just keeps getting more and more sticky. 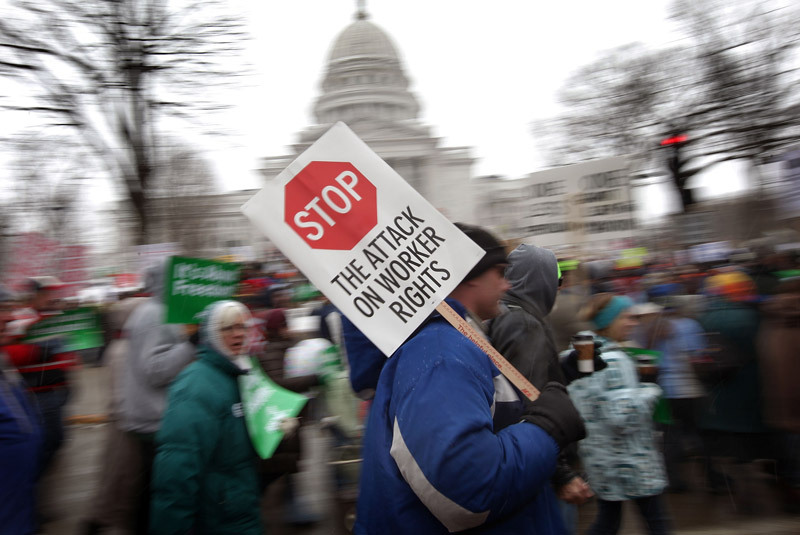 As you’ve probably heard by now, Republicans in the WI state Senate forced through their union-busting law through a tricky technicality – which seems like a pretty underhanded way of legislating to me. What was this trickery? Well, the senators, using a ploy that some Democrats in the state have denounced as illegal, removed parts of Governor Walker’s bill that were related to appropriating funds (technically at least), which allowed them to pass the bill without the minimum quorum of 20 senators required for bills of that nature. The Democratic senators who retreated to Illinois to hold the bill back, known by some as the “Wisconsin 14,” were outraged by the shifty legality of the Republican senators’ maneuver. And who can blame them? Even after all of their determination and the furious protests of state workers in the capital, the Republican senators have said, essentially, “Enough is enough.” The consequences of this decision are more or less exactly what Gov. Scott Walker wanted to happen: Unions have lost their collective bargaining abilities and have suffered an effective cut in pay. To me, this seems like pure shenaniganery (which is now a word) on the Republicans’ part. Now, it’s true that these officials were elected by the people back in November for a reason, and that reason was a new desire for fiscal conservatism. So it makes sense that the newly elected Republicans would want to honor that desire by effectively cutting the pay of public workers. But what point could there be to taking away collective bargaining rights, except to slice into a stronghold of Democratic sentiment? The idea that “budget” came into the decision is frankly ridiculous. On the positive side, this tactic has called the newly elected Republicans’ wisdom and discretion into consideration, and as many as 12 Senators may face recall this spring. The political fallout from this decision will no doubt be significant, and protests are still ongoing in Madison. So soon after the national turnover in elected officials from blue to red, it’s possible that new Republicans will be ousted from office before they can even get the rest of their plans into action. And even if no Republicans legislators are recalled after this, chances are this action hasn’t helped their street cred much, and we could see another total turnover in Wisconsin back to the democrats in the next election cycle. And if similar bills are passed elsewhere, by similar tactics, it’s quite possible that Republicans will lose a considerable amount of political momentum, perhaps even on a national level. Many people, even some who voted them into office, feel that GOP legislators and governors have taken the wrong approach to cutting the deficit, and are hacking away at things like collective bargaining rights, which is unlikely to save the country any money, instead of tackling real problems like social security or bloated military spending. 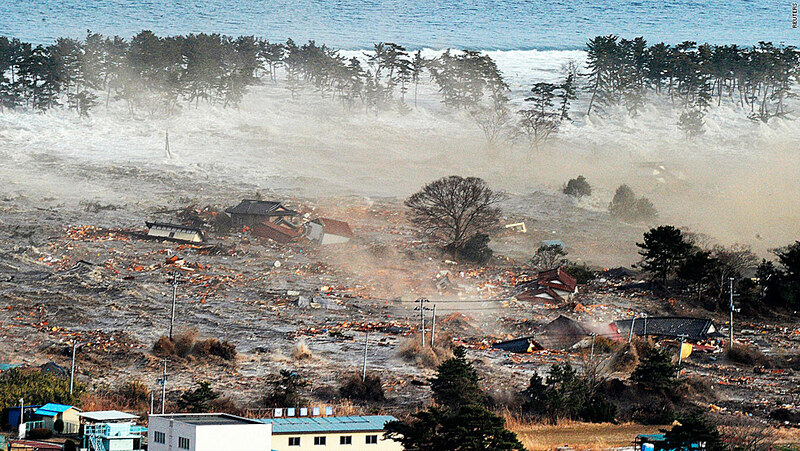 Unprecedented destruction on the coast of Japan. On March 11, Japan was struck with disaster. A colossal earthquake, the largest in 1,200 years, rumbled in the Pacific to the east of the island nation. The initial quake and its aftershocks caused great damage throughout the country, but, as often happens, the real catastrophe came with the water. Tsunami waves have pounded the eastern coast of Japan, leaving as many as 1,000 dead and thousands more missing or unaccounted for, leading authorities to fear that many more casualties are still possible. Oil refineries have exploded, trains have derailed, and countless homes and buildings have been swept away or utterly destroyed by this disaster. I really find myself at a loss as to what to say about this tragedy. The fact that thousands can be killed and thousands more have their livelihoods destroyed in such a meaningless and horrific disaster is appalling and terrifying. What answer is there for this? What purpose could possibly be behind this kind of calamity? I really can’t claim to know. I have close friends in Japan at this very moment that I haven’t heard from, and Japanese friends here in the US who haven’t been able to contact their own families. This is still a developing story, so there’s still a lot of uncertainty as to what has really happened and what will happen next. But for now, all I can do is implore anyone reading this to pray for the people of Japan in whatever way they see fit, and offer whatever support and affection they can to any who were affected by this disaster. What if we're all just speaking different languages to the same divine source? I attend a book discussion group every Tuesday night at a Methodist church in my town, which I might add is one of the best churches I’ve ever been lucky enough to attend. This last Tuesday (the 8th, I think it was), we were discussing the book we’re currently reading, when the pastor mentioned a fascinating idea that he had heard: Religion as a language. This immediately resonated with me in a way that I didn’t really understand, and still can’t claim to completely comprehend. Truth be told, he mentioned this idea only in passing, but it has stuck with me strangely. When I really think about this, it’s a very simple idea, but such a beautiful and profound one. Religion as a language. There are so many layers to this statement, so I’ll cover what I can in the time and space that I have! First, language is the key method we use to communicate with those around us, so a “religious” language might be seen as the way we communicate with the spiritual aspect of our lives. But, as with language, there is no one unique way of communicating with the spiritual. Some may speak the language of literal or verbal prayer. Others speak the language of meditation, and still others speak the language of dance or song. Just as we use different languages to talk to each other, we each can use different spiritual languages to connect to the spiritual in our lives, in the way that best fits our personal needs. Second, no one language needs to be dominant in any sense. While more people may speak a particular language, the fact that they speak it in no way takes away the validity or importance of another language. The fact that my first language is English doesn’t mean that every person must speak English. There is no “right” language that the entire world must know and understand, and no language can claim moral superiority over any other. A person may be raised with a language or choose to speak it, just as a person may be raised into a religion or choose one. And while it may come most naturally for someone to know and speak only in their own spiritual language, and only to those who understand them, I really don’t think it’s necessary. Just as someone can become multilingual, someone can become multispiritual! 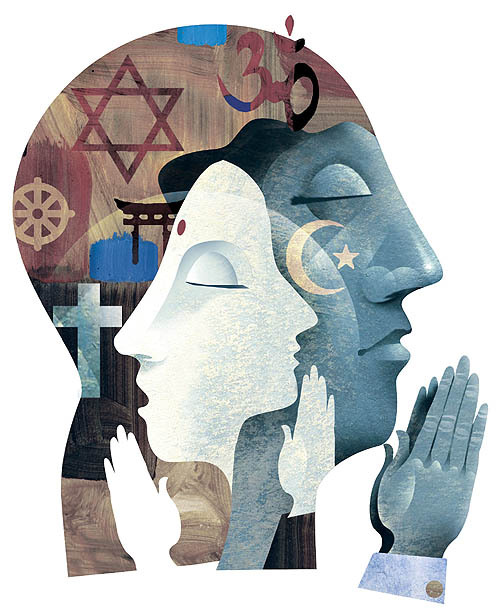 The conflict that so often arises between religions can be expressed in terms of language as well. If I speak my native language at someone whose native language is completely different, and neither of us knows the other’s tongue even a little bit, we can’t possibly understand each other! It’s the same with religious dialogue. If we can’t take the time and energy to learn another person’s spiritual language, the way they see the world and the spiritual, then there is no way we’ll ever understand each other. And this leads me to what I think is the most beautiful part of this analogy. If you think of religions as spiritual languages, then it becomes possible to envision a “multilingual” spiritual existence. In this way of thinking, a religion need not be elitist and dominating, but can be something that is understood by others who may speak a different language. If a friend speaks the language of Hinduism, I can grow to understand her way of seeing the world and the spiritual by learning some of her language. Perhaps, one day, I can even speak it myself! If we continue to tell ourselves that there is only one true language, only one way of understanding life, then we will never be able to approach others and their spirituality in a loving way. In fact, we don’t necessarily need to even understand another’s language; we need only allow them to speak it. I don’t need to fully understand the ways in which other people approach the divine. We only need to sit back and appreciate the beauty of their language, and allow them to speak to the spiritual in whatever way they know and understand. Only then can we achieve true religious understanding. Click here to subscribe to Mundi Cogito and receive email notifications of new posts! Mundi Cogito · Moving to a more global future.